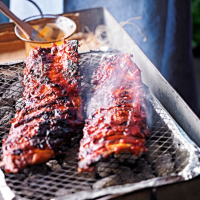 Try Heston's brined pork loin ribs marinated and cooked in a delicious barbecue sauce. A fabulous dish fit for an alfresco feast. 1. For the brine: heat 1 litre of water in a large pan and bring to the boil. Add the salt and whisk until fully dissolved. Remove from the heat and pour in 1 litre of cold water. Allow to cool completely. 2. Pour this brine into a large plastic container, add the ribs and cover with the lid. Place the ribs in the fridge for 1 hour. 3. Mix all of the marinade ingredients together (except the stock) and place in a bowl. Drain the brined ribs and transfer to the marinade, making sure they are well coated in the marinade. Leave to marinate for at least 1 hour. 4. Transfer the ribs into a wide shallow pan with the marinade and add the stock. Over a medium heat, allow this to come to a boil and reduce to a simmer. Cover and cook for 1 hour or until tender. Remove the ribs and bring the marinade to the boil and reduce to a thick sauce consistency. 5. Before serving, place the ribs on a hot barbecue for 5-10 minutes, brush regularly with the thickened marinade. Serve the ribs topped with the sauce.